Aqua Systems is proud to announce the introduction of the Aqua Trike – a mobile event hydration solution created in a new and green format. 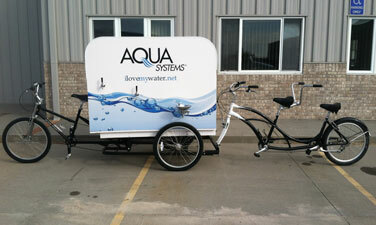 The Aqua Trike is a drinking water station that has two drinking fountains and four taps. This station is fashioned on a tandem tricycle that is powered by three riders and uses no fuel. Aqua Systems rolled out their new service on April 12 in honor of Earth Day. They launched the new anti-bottle campaign to help eliminate the need for disposable plastic bottles when hosting large events. Aqua Systems’ new service will provide unlimited free water for their clients’ guests and it will help to save money on the typical bottled water expenses. Aqua Systems is an industry leader in the point of use cooler market as well as hydration specialists who provide water softeners, drinking water systems, water purification, problem water solutions and large-scale water solutions for residential and the business industry. They have been helping people improve their water since 1959, and service South East Nebraska as part of a national company that has over 300 dealers nationwide. For more information about Aqua Systems, please contact Jeff White at (402) 466-6800, or email him at Jeff@ilovemywater.net.